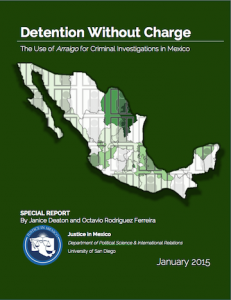 Justice in Mexico is pleased to announce the publication of Detention Without Charge, a special report provides a detailed assessment of the use of arraigo as a prosecutorial mechanism in Mexico, as national and international organizations have increasingly questioned the practice. Evidence collected for this report suggests that detention without charge is a poor substitute for due process protections that help to ensure the integrity and legitimacy of police and prosecutorial investigations. Arraigo, is a form of preventive detention that allows for imprisonment without formal charges for up to 80 days. This investigative tool is presently authorized under Article 16 of the Mexican Constitution as amended in the 2008 reforms that underpin Mexico’s ongoing transition to adversarial criminal justice. 3,166 arraigos were requested by prosecutors from December 2006 through December 2012, of which 2,939 were granted by judicial authority; thus, only 277 requests were denied. Overall, from 2007 to 2012 the percentage of arraigos denied by the judicial authority was just 7%, which indicates that once the prosecutor submitted its request to the judicial authority, 13 out of 14 suspects were detained under arraigo. Of those 13, at least seven were held for more than the initially granted 40-day period. Statements from Mexican authorities suggest that only 3.2% of all arraigos from 2011 to 2012 led to a conviction, meaning that the margin of error could be more than 95%. Preventive and administrative detentions refer to detention without charge, and are contrary to basic human rights law and specific international conventions, such as the Universal Declaration of Human Rights, the International Covenant on Civil and Political Rights, and the American Convention on Human Rights. Because of the arbitrary nature of detention and prevalence of torture and other human rights violations under arraigo, it has received criticism and grabbed the international attention of numerous human rights organizations and bodies, from the United Nations to Amnesty International, and domestically from Mexico’s National Human Rights Commission to the Mexican Commission of the Defense and Promotion for Human Rights, among many others. Reports by the United Nations and other national and international organizations have found patterns of violations under arraigo, including denial of counsel, torture, and being held incommunicado. The length and reasonableness of detention, access to counsel, judicial access, torture, and/or right to habeas corpus are all issues raised by human rights advocates and international organizations about the practice of arraigo. Mexico is not the only country that applies a regime of preventive detention. Other countries, especially under the flag of “preventing terrorism,” have developed their own forms of detention with certain similarities, but evident differences from arraigo. Examples are the United Kingdom, Ireland, and Israel, among others. The authors recommend that the use of arraigo be eliminated and prohibited by the constitution, or at a minimum that major modifications be made to provide some measure of protection of the fundamental rights of individuals detained without charge. This is one of a series of special reports that have been published on a semi-annual basis by Justice in Mexico since 2010, each of which examines issues related to crime and violence, judicial sector reform, and human rights in Mexico. The report was formally released on January 12, 2015 and was made possible by the generous support of the John D. and Catherine T. MacArthur Foundation. This entry was posted in Publications, Special Reports and tagged Arraigo, Human Rights, International law. Bookmark the permalink. ← News Monitor Vol. 9 No. 12 now available!